Prometheus, SDS Authoring Software – Update now available. A significant update to the CLP Regulation will see Poison Centre information harmonised across the EU. The legislation will begin being phased in on 1st January 2020. In accordance with Article 45 of CLP, each Member State has an appointed Poison Centre that is responsible for receiving information from importers and downstream users who place hazardous chemical mixtures on the market. This information is relevant for formulating preventative and curative measures, particularly in the event of an emergency health response, and is required for any chemical mixtures placed on the market which are classified as hazardous on the basis of their health and physical effects. In light of this new legislation, companies will need to adapt their submission systems to be able to send the information in XML format to the poison centres. Submitting data to poison centres could be a complex process but Prometheus is able to assist in complying with the new requirements. Much of the information required to be submitted to poison centres is already available on Safety Data Sheets (SDSs). Prometheus can now prepare data for companies that have an obligation to notify Poison Centres of their hazardous mixtures and biocides – and write XML files, ready for despatch to them. 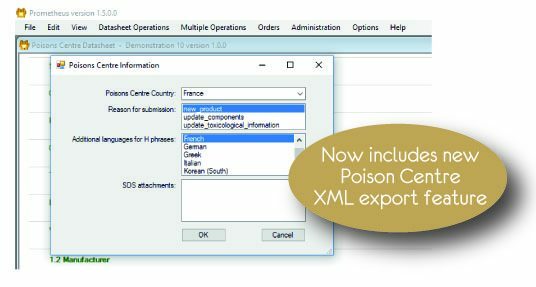 Prometheus SDS Authoring Software creates editable datasheet-like documents from which you can export XML files for delivery directly to Poisons Centres in any Country within the EU. Master datasheet concept. You can maintain one master datasheet and create multiple child sheets from it for different territories, company subsidiaries, and blocks of customers, in different languages, with a single click of a button. Automatic translation into multiple languages. Essential to all companies that use translation. Currently 26 languages – most European ones plus Chinese (traditional and simplified), Korean, Malay, Russian, and Arabic. Security – multiple access levels. Access to Prometheus is name and password controlled. You can set different levels of access – e.g. for staff empowered to create, approve, or despatch SDSs. Strict control of SDS versions. A new datasheet is hidden from users who do not have editing privilege, until it has been approved. Once it has been approved it is available to everyone and can be printed and exported. The approved version cannot be modified but a new version can be created. The new version is hidden until it has been approved. When it is approved it becomes the current version and earlier versions are not displayed unless they are searched for specifically. Despatch PDF versions of datasheets automatically to designated customers. Manage customer lists. Set up a database of customers to whom SDSs and SDS updates are sent. Inclusion of bespoke images. You can add your own images within the body of datasheets. Write reports on product ingredients and label contents. Lists of the components of datasheets and of the hazard and precautionary phrases used in datasheets can be written to CSV and XML files – these are sometimes requested by regulatory authorities. Territorial flexibility and future-proofing. You can convert SDSs automatically to conform to different layout and content (e.g. when a change in regulations requires information to be moved from one datasheet section to another; when the rules on the ordering of sections change). Companies are advised to start now to prepare for the new notification system by identifying deadlines relevant to their products. Companies need to be ready with the UFIs on labels before their deadline to submit the product information to the Poison Centres. In practice, this means that the generation of UFIs and the printing of appropriate product labels should be carefully planned into your company’s schedule and can be executed in advance of the relevant submission deadlines. See here for more information on Prometheus, SDS Authoring Software. Hibiscus Plc is ready to support you with the authoring of Safety Data Sheets and production of labels, allowing you a smooth transition into 2020 compliance.